We all know that the African plains are home to some of the wildest and most beautiful creatures on Earth. Raging Rhino which was designed by WMS Gaming aspires to bring that beauty to your mobile and desktops, through their popular slot game. 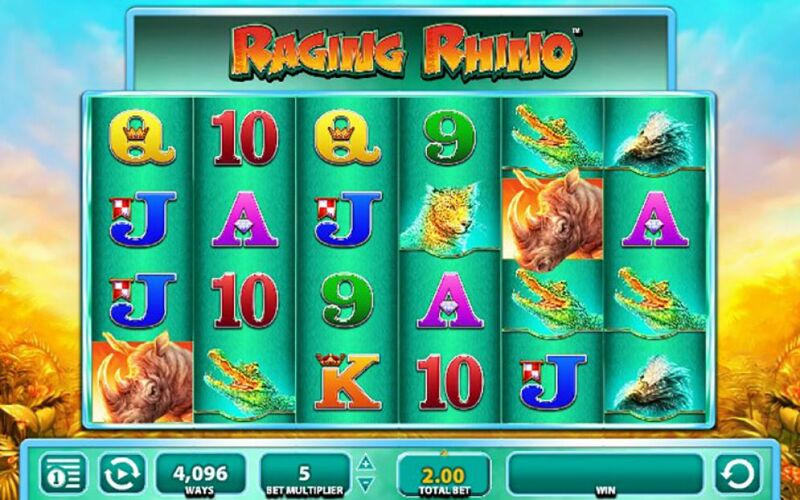 Raging Rhino is a 6-reel, 4096 ways to win slot, yep you read that right! Despite the huge potential ways to win the RTP is rather low at 95.91%, but don’t let that put you off. There is a nice soundtrack playing along with animal sounds that trill about until the reels spin and then there are some nice African tunes to listen to. A nice twist is that when the reels spin they expand and move forward on the screen, almost bringing them to life. Bet Amounts – Betting begins at 40p per spin and can be increased to a maximum of £60 per bet. You have the option of amending your bet amount by changing the multiplier or by changing the actual bet. However whichever way you choose the results remain the same, with 40p at the lowest and £60 at the highest. Wild Symbol – An African sunset scene is your wild symbol and it will only appear on reels 2, 3 and 4. It will substitute for all other symbols except the diamond scatter. Scatter Symbol – A stunning diamond is your scatter symbol and landing 3 or more anywhere in view will activate the bonus spins feature. Doubling up as your highest paying symbol as well, look out for landing 3, 4, 5 or 6 of these to gain your scatter wins. Six scatter symbols will award a massive 60,000x coin win. 6 scatter symbols will award 50 bonus spins. Whilst the bonus spins are in play if a wild symbol lands and forms part of a winning combination, it will also add a x2 or a x3 multiplier to that win. You can also extend your spins by landing just two or more diamond scatters on the reels, anywhere in view. If you land 2 scatters you will have an extra 5 spins added to your total and 3, 4, 5 or 6 more scatters will add extra spins as shown above. Raging Rhino Feature – It’s not called Raging Rhino for nothing as there is a little something lurking about waiting to strike. Every so often when you land enough wilds on the reels at the same time, a rhino will come bursting off the reels creating massive wins for you. Overall Raging Rhino isn’t packed full of features, but sometimes less is more and that is definitely the case here. The simplicity of the game with the addition of the extra reel just gives it that little bit of an edge and its enough to keep players coming back for more each time. The big money is in the bonus spins round, especially with the extra twist of the x2 or x3 wild multiplier in play. Let’s not forget it can be retriggered time and again, for those lucky enough to land extra diamonds and trust us those extra diamonds happen more often than you would think. All in all a delightful game, that can be very rewarding on the pocket if you are willing to play a while. But if you are after quicker wins then this may not be for you.